I finished it! The entire program is DONE. All 30 days of sweat and heart racing workouts. 30 days of strictly following my meal plan every day at every meal. It’s honestly been a rollercoaster. Some days I felt amazing, and others, I felt like giving up. My husband, shout out to him, did the ENTIRE program with me also! It’s been quite the journey, and we’ve both lost 😉 and gained so much! This experience has been life changing. To know we can set a goal and commit to finishing it and then achieving that goal has shown us that we CAN do hard things, and that we are stronger together. All the girls in my private fitness group have also hit their 30 day goal and I am honestly SO SO proud of each and every one of them. This online community has been amazing for giving me motivation on days I didn’t have it. We had to send the group our sweaty selfies after each workout and that kept us all checking in on one another! 30 Days are done, and just in time too. We leave on our amazing cruise vacation February 10th and am so excited to rock those bathings suits proudly. There is still a long way to go still, I know fitness doesn’t end because a vacation comes around, so I commit now to starting and finishing the 21 Day Fix EXTREME. I WILL be doing the workouts on the cruise! Though, forgive me if I don’t follow the meal plan as closely while I’m away. Life is about balance you see, and some long island iced teas await me on the ocean. Let’s take a look at this last and tough week! If you missed week one’s review, make sure you give that a read first! I go into more detail explaining what Core de Force is all about! Core De Force – Week One Review . 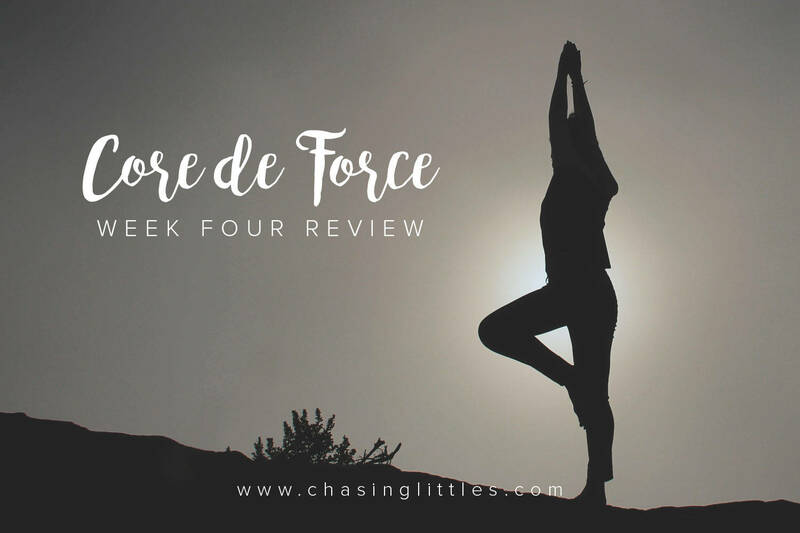 Core De Force – Week Two Review . Core De Force – Week Three Review. I have a goal this year to workout for 100 days in a row. And I’m now 30 days IN! I can’t believe I’ve stuck with it every day! Core de Force is NOW my favourite program. Here’s how week four looked like. Measurements are my favourite way of tracking progress. Though I do weigh myself. Simply because I have a scale and I don’t have anxiety about the number on the scale. Though if you do, stick to measuring! Total Inches LOST since day one: 10.75″ – Guys I’m just in shock. My body changed so drastically in just 30 days. I have no words but just to tell you to do it. Do it, follow all the steps, trust the program, trust the process and you will amaze yourself. Total pounds LOST since day one: 7.5lbs I’m so happy to be back in the low 140s, I hadn’t been here in years. I honestly don’t foresee much more change in the weight department, My body is now ready to tone some muscle which is why I’m leaving the cardio behind with Core de Force and embarking on the extreme journey that is the 21 day fix extreme. Weights, resistance band. Here we come! Week 4 we went pretty simple again along with a few favourite recipes from Fixate that keeps the portion fix in mind! I share my complete meal plan so that you can see every step of the journey. This is a meal plan with the Portion Fix Containers in use that come with this program! It’s super simple so my portions are easy to follow with these colour coded containers! If you want to see some of the meals in action, here are some of my instagram shots, for more of these and to follow along in my journey make sure to follow my instagram account @coachmariangelica ! Monday – MMA Plyo (47 minutes) + Core Kinetics (16 minutes) – Haaard day. Plyo s intense and then those 16 minutes of core work feel like a break after all that cardio! Fat burning day! Tuesday – MMA Power (47 minutes) + 5 Min. Core on the floor (5 minutes) – 12 rounds my friends, 12 rounds of MMA explosive moved. Fast paced cardio, but the rounds fly by. Get ready for some jump rolls! 5 Minutes of core is basically a 5 minute plank with variations. Wednesday – MMA Plyo (47 minutes) + Core Kinetics (16 minutes) – Monday repeat, it’s like they know this is the hardest combo. Thursday – Dynamic Strength (47 minutes) + 5 Min. Core on the floor (5 minutes) – Low on impact, but high on intensity. You can really feel yourself carving out your shape with all the twists! 5 Minutes of core is basically a 5 minute plank with variations, some side planks, plank steps, plank everything. Get ready to feel that core BURN. Friday – MMA Speed (24 minutes) + Core Kinetics (16 minutes) – This is such a nice welcome. We haven’t done Speed since the first week, here’s your chance to see ho much better you’ve gotten! And of course, love that core work. Saturday – MMA Shred (37 minutes) + Core Kinetics (16 minutes) – Get ready to SWEAT. Shredding everything and it seems like Core won’t get any more breaks! Sunday – Active Recovery (21 minutes) – 10 minutes of slow conditioning work that definitely made me break a sweat, quickly followed by the most relaxing stretch session ever for the remaining 11 minutes. It’s the shortest workout but not one to skip over lightly. Monday (DAY 29) – MMA Power (47 minutes) + Core Kinetics (16 minutes) – 12 rounds my friends, 12 rounds of MMA explosive moved. Fast paced cardio, but the rounds fly by. Get ready for some jump rolls! Core Kinetics is intense but so amazing for really forcing you to engage your core, love those 16 minutes just hard after 47 minutes of intense work! Tuesday (DAY 30) – MMA Plyo (47 minutes) + Core Kinetics (16 minutes) – Hardest workout for your last day, seems fitting! THAT’S A WRAP! I completed something I started! My husband stuck with it every day and together, we finished strong. I feel like I can accomplish anything now! Bathing suit wearing does not make me nervous! and I actually ENJOYED shopping for one! Order your Core de Force program here if you live in CANADA! Order your Core de Force program here if you live in the USA! If you’re nervous about starting this alone, here’s the deal, you don’t have to! I run monthly challenge groups and I’d love to help you through it and share tips I learned during my first go at it! 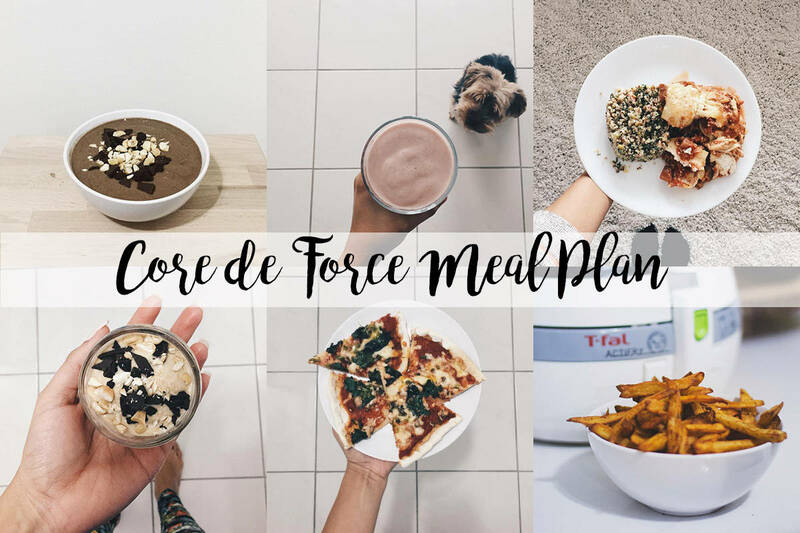 If Core de Force looks too intense for you, fill out this form to tell me what kind of goals you are trying to reach and I’ll help you find the perfect program for you, and work along side you as your accountability partner! I hope you found this review helpful and that if anything it gets you excited about starting a new fitness program where the hard work has been done for you in calculating when to work what muscle group and what to eat and how much. All you have to do is show up, and by show up I mean press play! Workout at home, get amazing results. It’s possible. Next Post You Failed, Now Let’s Move On.